Book Review: “The Myth of Religious Violence” by William Cavanaugh | J.W. Wartick -"Always Have a Reason"
William T. Cavanaugh’s The Myth of Religious Violence (hereafter MRV) examines the oft-perpetuated notion that religion causes violence. Cavanaugh levels an attack against this notion that comes in two primary directions: 1) He argues that “ideologies and institutions labeled ‘secular’ can be just as violent as those labeled ‘religious'”; 2) He argues that the “twin categories of religious and secular” are constructs which are used to “provide secular social orders with a stock character, the religious fanatic, to serve as enemy” (3-5). Cavanaugh first turns to the analysis of violence. He argues that rather than just declaring “religion” violent, people should engage in an empirical study. In analyzing various “ideologies, practices, and institutions” like “Islam, Marxism, capitalism, Christianity, nationalism, Confucianism, secularism, Hinduism…” “A careful examination of the varieties of each [worldview] and the empirical conditions under which each does in fact support violence is helpful and necessary. What is not helpful is to divide the above list into religious and secular phenomena and then claim that the former are more prone to violence… such a division is arbitrary and unsustainable on either theoretical or empirical grounds” (16). [T]here is no doubt that, under certain circumstances, particular construals of Islam or Christianity contribute to violence… Where the above arguments [about the intrinsic ties of religion to violence]–and others like them–fail is in trying to separate a category called religion with a peculiar tendency toward violence from a putatively secular reality that is less prone to violence. There is no reason to suppose that so-called secular ideologies such as nationalism, patriotism, capitalism, Marxism, and liberalism are any less prone to be absolutist, divisive, and irrational than belief in, for example, the biblical God (54-55). In a very real sense, MRV could just as easily be titled The Myth of Religion. Cavanaugh argues extensively for the conclusion that “Within the west, religion was invented as a transhistorical and transcultural impulse embedded in the human heart, essentially distinct from the public business of government and economic life” (120). The attempt to define “religion” has “nothing close to agreement among scholars…” (57). In fact, “[t]here is a significant and growing body of scholars… who have been exploring the ways that the very category religion has been constructed in different times and different places… Religion is a constructed category, not a neutral descriptor of a reality that is simply out there in the world” (58). Following Jonathan Z. Smith, Cavanaugh states, “religion is not simply found, but invented. The term religion has been used in different times and places by different people according to different interests” (58). Cavanaugh argues towards these conclusion through multiple lines of evidence. First, the concept of religion itself is different across different times and places. The Western notion of religion is not mirrored in other cultures (61). Yet even in the west, the concept of what denoted “religion” evolved. The concept was used simply to mean “worship” in the past (63). Through the medieval period, religion basically just meant “rites” or “piety”: religion was “not a universal genus of which Christianity is a particular species” (64-65). Thus, religion was “invented in the West.” Now it has come to mean a “universal genus of which the various religions are species” (69). Part of this development was due to a need in the Reformation to demarcate differences between the varying schools of thought (72ff). When moderns use the concept religion in a universal fashion, such as Edward, Lord Herbert of Cherbury (1583-1648) did, the problem “is that it is unfalsifiable. In constructing an a priori religion in the minds of all people, Herbert [and those like him] has made his theory impervious to empirical evidence. All evidence is seen and interpreted through the lens of his religious view a priori” (77). “There was a time when religion, as modern people use the term, was not, and then it was invented” (81). MRV then outlines two ways to define religion, either through a substantavist–one which focuses on the content of religion–or functionalist–which focuses on how a practice functions–approach. The problem with a substantivist definition is that “even if one were able to come up with a coherent, transhistorical, and transcultural definition of religion which would include things like Christianity and Confucianism and Buddhism and exclude things like Marxism and nationalism and capitalism, it would not tell us anything worthwhile about the cuases of violence. Indeed, to exclude [the latter three] a priori from an investigation of violence in the service of ideology in fact distorts the results of any such study” (105). Functionalist definitions fare slightly better because they define religion in such a way that “‘if it looks like a religion and acts like a religion, then it is a religion'” (109). This approach is capable of including things like the American Civil Religion. Thus, Cavanaugh states that “there is no transhistorical or transcultural concept of religion. Religion has a history, and what counts as religion and what does not in any given context depends on different configurations of power and authority… the attempt to say that there is a transhistorical and transcultural concept of religion that is separable from secular phenomena is itself part of a particular configuration of power, that of the modern, liberal nation-state as it developed in the West (59). The crucial test, however, is what people do with their bodies. It is clear that, among those who identify themselves as Christians in the United States, there are very few who would be willing to kill in the name of the Christian God, whereas the willingness, under certain circumstances, to kill and die for the nation in war is generally taken for granted (122). This story is more than just a prominent example of the myth of religious violence. It has a foundational importance for the secular West, because it explains the origin of its way of life and its system of governance. It is a creation myth for modernity (123). Following the lines of thinking of Voltaire, John Locke, and others, Cavanaugh argues that the myth of religious violence is perpetuated in order to marginalize that which is considered religious and give rise to the nation-state. According to this myth, “All theological religions are to be tolerated, provided they do not interfere with the obligations of citizens to the state…” (129). The myth is that religion is divisive and that they “fight over doctrines or ‘religious creeds'” so that “the state steps in to make peace” (130). Cavanaugh shows that this myth is indeed false. The “wars of religion” had any number of motivating factors. The use of this story is not so much to tell a truth as it is a means by which to legitimize the nation-state. He argues towards these conclusions by showing that many “wars of religion” were in fact wars of economy, wars of power structures, and the like. He notes four primary factors for this myth to work: that combatants were motivated by religious difference, that the primary cause of war was religion, that religious causes are analytically separable from political, economic, and social causes at the time of the wars, and that the rise of the modern state was not a cause of the wars (141-142). He then analyzes each of these in turn based upon the historical record and shows that these all fail to account for the actual history of the “wars of religion.” In fact, the opposite is true in each case (142-177). “We must conclude that the myth of the wars of religion is finally incredible, which is to say, false” (177). Perhaps the most challenging and paradigm-shifting portion of the book is that which focuses upon the uses of the myth of religious violence. Cavanaugh argues that the myth is so perpetuated because of its usefulness. First, he analyzes the use of the myth in building the “wall of separation” between church and state. He examines a number of supreme courses and how the myth of religious violence was used to favor the constructed notion of “secular” over that of “religious” (183ff). The myth of religious violence is used to create a religious “other” which can then be exploited, coerced, and denigrated. “[R]eligion–or more precisely, religion in public–is what the liberal nation-state saves us from” (192). History is revised in order to show how religion is that which causes violence, while the secular nation-state is that toward which we should turn for salvation. Oddly, it is permitted, encouraged, and sometimes even required to give devotion to the nation state, while this is not religious. “We are all Americans, and devotional exercises [the pledge of allegiance, venerating of the flag, etc.] meant to instill love of our country are unitive, not divisive. Such exercises, however, are not religion. Patriotism, in this world view, is defined over against public religion. To allow that patriotism might be a type of religion and might carry its own dangers of violence would threaten the very basis of our social order” (192). On a functionalist definition of religion, however, nationalism counts as religion. “American religion” has “saints (the founding fathers)… shrines (Independence Hall)… relics (the Liberty Bell)… holy scriptures (the Declaration of Independence, the Constitution)… martyrs (Lincoln)… inquisition (school boards that enforce patriotism)…” and various religious festivals (Flag Day, the Fourth of July) (117). Nationalism is prevalent in many countries. Religion is privatized, secular nationalism is standardized and enforced. Not only that, but “Only the nation-state may kill” (118). The myth is also used to hide possible “secular” causes for war. Al Qaeda is specifically religious, and the West is all too happy to use this to ignore the fact that its own mistakes in installing regimes in the Middle East has caused the rise of absolutist, controlling states (202ff). Worst of all, the myth of religious violence has been used to carry out violence against the religious other. Those who perpetuate this myth often use it in order to legitimize violence against the religious person, who, after all, is irrational and incapable of reason due to their religious beliefs. Sam Harris is a prime example of this notion. He argues that “There are other ideologies with which to expunge the last vapors of reasonableness from a society’s discourse, but Islam is undoubtedly one of the best we’ve got” (HarrisThe End of Faith, 136, quoted in Cavanaugh, 214). Furthermore, “Some propositions are so dangerous that it may even be ethical to kill people for believing them… Certain beliefs place their adherents beyond the reach of peaceful means of persuasion while inspiring them to commit acts of extraordinary violence against others” (Ibid, 52-53, quoted in MRV 213). Notice how this works: the religious other is that which is unreasonable and violent; in order to stop their violence, it may be ethical to kill them for their beliefs. Harris is not the only one who perpetuates this ideology. Cavanaugh cites a number of other thinkers who have utilized the myth of religious violence in this fashion. Killing for religion is bad, killing for the state is often good (219). As Cavanaugh states, “The myth of religious violence thus becomes a justification for the use of violence. We will have peace once we have bombed the Muslims into being reasonable” (215). This analysis of violence again plays off the myth of religious violence: “Violence labeled religious is always irrational, particularly virulent, and reprehensible. Violence labeled secular, on the other hand, no matter how regrettable, is often necessary and sometimes even praiseworthy for the job it does defending us from religious violence” (216). Violence feeds on the need for enemies, the need to separate us from them. Such binary ways of dividing the world make the world understandable for us, but they also make the world unlivable for many. Doing away with the myth of religious violence is one way of resisting such binaries, and, perhaps, turning some enemies into friends (230). It is rare that one comes across a book that forces them to rethink just about everything they have thought about a specific issue. 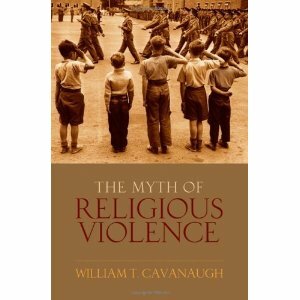 William Cavanaugh’s The Myth of Religious Violence is one of those books which will challenge readers on every level of the discussion. It has an extremely broad scope, but argues convincingly and with a depth that seems almost indefeasible. The myth of religious suffers a number of serious defects. It assumes an unwarranted division between the constructed categories of “religious” and “secular,” it oversimplifies the justification for violence, it is a clear example of a creation myth used for the founding of the nation state, and most alarmingly it is used to justify violence against the religious other. The myth of religious violence may live on on the popular level, but Cavanaugh has dealt its death blow. Whether it takes 50 years or never happens, the myth has been destroyed. The review has been lengthy, but that is due to the importance of this topic. I will be expanding on and elaborating Cavanaugh’s ideas over the course of the next 1-2 months. Check back here, where I will post links to future posts, or be sure to follow the blog to catch the posts over the coming weeks. Finally, I want to say that this book was a gift from an anonymous donor from this site and I must say Thank you, you have been a huge blessing! It was so delightful to receive a book out of the blue, and to have it be so fantastic was another reward. William T. Cavanaugh, The Myth of Religious Violence (New York: Oxford, 2009). You’re acknowledging that religion can be violent, and often is. I haven’t met anyone who tried to make the argument that ONLY religions commit violence or historical atrocities. I think the argument comes from the fact that religion has been a ubiquitous banner of tribalism for millennia. More than any other force over the mind of man, religion offers you your own, tailored brand of life after death in paradise. That is a hugely powerful idea that catches like wildfire for those exposed to it early and often. When one’s brand doesn’t match the others’ (and, indeed, isn’t content to just be but must also claim the other is wrong), violence happens. Also, your comments here are exactly the sort of thing that Cavanaugh shows is part of that denigration of the religious other. All banners can be used for violence. The importance is an empirical study of under what conditions an ideology–any ideology–lead to violence. Triple post–I’ve run into many an atheist that writes off any violence in ‘secularism’ to be actually religious. Cavanaugh points this trend out by citing numerous sources. Think of Sam Harris for example. You mention Stalin to him and he says Stalin was religious because his communism became a religion. Hmm….? So, I think we fundamentally agree: any idea, when stretched an order of magnitude to an extreme, can become violent. But, even with Stalin’s atheist communism, what was the power-lust in his situation? Was he driven by a lack of belief in gods, by the idea that death is just…the end? Why would he murder millions for that idea? Or, was it the worship of government and a lust for power that drove Stalin to commit the atrocities he did? Attributing his actions to atheism, or as a result of atheism, or even related to atheism, is ignoring the record of history. The funny thing about religion is it often deals in absolutes a la my group is going to enjoy paradise in heaven while your group isn’t, or vice versa. Death is one of the few aspects of the human experience that nobody escapes. And people have been dealing with its implications for many thousands of years. This makes religion volatile because each one ultimately provides an answer for something beyond death. Because death is so emotionally charged (borne out of both natural fear of death and the sorrow felt when a loved one passes), the “answer-holders” contribute to a greater propensity for violence. The same can be said towards atheism, as theists seem to become quite angry at the implication that life is over when it’s over. And yeah, I would have to agree with Harris’ assessment. For Stalin, politics became more than politics. It became religious fervor. “Religious” because of the dogmatism of communism (the rules and criteria for being a communist, or for living in a communist state). Are you suggesting you don’t deal with absolutes? Everyone has absolutes. It is part of a total worldview. At some point, you’ll have an absolute. Harris’ point only makes sense in a system that automatically relegates anything bad to religion. If it’s extremist, it’s religious, if it’s absolute, it’s religious, etc. That is exactly what Cavanaugh points out: the category is a construct made in order to stigmatize the “other.” It makes us carpet bomb others in the hope that somehow that will change who they are. Great review of this great book. This book, along with the books of Cavanaugh’s friends, Connor Cunningham and David Bentley Hart, really ended the new atheist rhetoric campaign. Unfortunately, they require a level of knowledge and discourse that far exceeds the contemporary debate and will largely be left unread. Did you happen to read Peter Leithart’s review of this book? It is one of the most entertaining reviews I’ve ever read…of anything. I just want to point out that the debate is far from over. Christianity is declining in the world at an astonishing rate. If the debate were over, I hardly think that would be the case. The United States experienced a 13% decline in people with a religious identity in just 7 years. The global rate was a drop of 9% over the same time period. The biggest drop was in Ireland, where a 22% decline was recorded. It seems the “truths” don’t stand on their own as well as one should hope. Clever rhetorical jab, but truth isn’t measured by polls no matter what worldview is in question. Argumentum ad populum just doesn’t do it. Andrew this is horrible logic, even if there was 1 Christian left in the that wouldn’t make it any more false then if 100% of the world was Christian. Islam is the rise, so does that mean it is the ‘truth’? I’m starting to think now that any atheist who denies existential nihilism and doesn’t give a good reason why nihilism is false is an atheist that = a religious person. If one is going to live life as if it has an objective ‘purpose’ then they should have good reasons for this purposeful mindset. The definition of ‘Theism’ or ‘Deism’ does not necessarily imply a religion is needed. A good portion of the founding fathers of the U.S were ‘Deists’, but yet this (from what we hear from our village atheist friends) is a secular country, so this is an instancein favor of Deism having nothing to do with religion. Or perhaps a person who believes a God exists, and that’s it. No books, no prayers, nothing after that. So in short, this just shows a priori that both Theists and Atheists can be religious or non-religious as the definition has nothing to do with entailing any religion as a necessary property to Theism or atheism. What’s funny is, atheism doesn’t imply or deny a belief in the paranormal, curses, astrology, palm readings, psychics, tarot card readings, luck etc. Neither does Theism. The definitions are actually simple, but from what I’ve been seeing from the village atheists is that somehow atheism implies ‘something else’ such as rationality, but this is all just a biased case of sugarcoating a definition. All and all, I believe atheists CAN be religious (look at Buddhists). It doesn’t matter about the definition that defines person X’s viewpoint on the nature of reality, it matters moreso about THE ACTIONS of that person. I also will argue that Anti-Theism = a religious mindset. Actions speak louder than words, and definitions cannot save people who call themselves atheists. So in conclusion you will notice the self-refuting logic that comes about from hateful village atheists as they take the religious mindset whilst insulting religion. Religion is poison? Seems like the pot calling the kettle black…. My take on it (without having read the book, of course), is that violence committed in the name of “nationalism” is generally related to acquiring more power, land, resources, and generally not based on “supernatural” beliefs. Wars or violence motivated by religion, however, are often based upon fanciful and strange beliefs that have no basis in reality. In other words, wars have been fought for all sorts of reasons, but the religious ones have motivations that make them much more frightening. If a group of men can believe that they must fly an airplane into a building to destroy apostates, and thereby enjoy an afterlife in paradise with 99 virgins and all that stuff… then who knows what else can motivate someone to violence. At least with a nut-job like Stalin you know its all about power and control. BTW, this is a great website, and fascinating reading, even if I do feel a little under-schooled at times. “nth_dimension”- first thanks for your really kind words on the site. I try to have a mix of posts and pretty much just follow whatever strikes my fancy at the time. The dichotomy you point out is something Cavanaugh specifically argues against. In the first chapter he surveys a number of thinkers who try to do that very same thing with religion and he shows how they all fail to do anything but make a construct with no empirical value. I am constantly amazed at the still regular belief that most of our Founding Fathers were deist. Where do people get this stuff? Do they only look at 5 or 6 and say, “Well, that was the majority?” Good grief! There were nearly 200 “founding fathers,” and many were either ordained ministers (Christian), not deists. Thomas Jefferson wasn’t the only founding father. Other than that, excellent review. I can’t imagine how the book could be much better. Hey, someone already said what I was thinking! My problem with the ‘religion is this’ and ‘religion is that’ claims is that I think the definitions of religion are suspect and arbitrary. If someone can give me a definition of religion that includes atheistic eastern ideologies like Buddhism and excludes communism, socialism and marxism, I could actually consider using it as a valid classification. As it is, the label of ‘religion’ just looks like an ill-defined tool of marginalization to me. By arbitrarily grouping ideologies under that label, you can call them violent, irrational, dangerous and a million other things with impunity. Thanks for your kind words and the reblog! I think this is a very tough topic and it is much easier to simply say “Religion is violent!” or “X is Y!” Blanket statements are easy, but very frequently false. The key is to look at the root causes of violence and see how essentially any ideology can be twisted to do violence. As Vox Day points out in The Irrational Atheist, the worst Christian ruler in terms of willingness to kill his own citizens was Charles IX of France. He murdered 10,000. If he had killed twice as many he’d only have equaled the 50th most lethal atheistic regime of the 20th Century. When you consider there were about 1700 years of Christian rulers, and 100 years (200 if we count the French Revolution) of overtly atheistic ones that’s a pretty staggering statistic. To say that “an atheistic killer wasn’t killing in the name of atheism” is a pretty irrelevant statement. Dead is dead, and being killed because you’re seen as a counter-revolutionary is no different than being killed because you don’t say your “Hail Marys” properly. The difference is that in a Christian country you were less likely to be killed than in one run by an atheist. If we adopt the Chinese idea that every person has a good dog and bad dog inside them, then the testimony of history is that atheism is much worse at keeping the bad dog in check than Christianity is. Well done, J.W. Well done. This is how to review a book. Draw all the main points out so that people like me who’ve got tons of unread books still on the shelf won’t need to read the entire thing, but could choose to do so. Thanks! I hope you’re not saying my reviews that I write now aren’t as good! I kind of changed up the format because it was hard to write such lengthy reviews. That said, I’m glad I took the time and effort to write up a review for this one that outlined it so well. It’s a fantastic book that I have re-read and enjoyed just as much the second time through. Ha! Of course you’re other lengthy reviews are great, too. I was just telling any of the readers (and those of us who hang out in the comments section) that this is a great example of how to write a review: clear, concise, and to-the-point.